Bihu delicacies from my Ma's kitchen. All served in bell metal dishes. 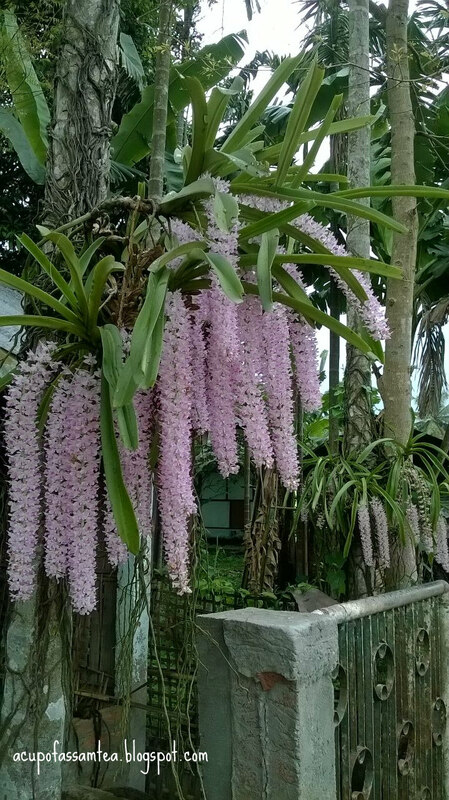 I miss home Assam every single day, perhaps around this time of the year even more for not being there. 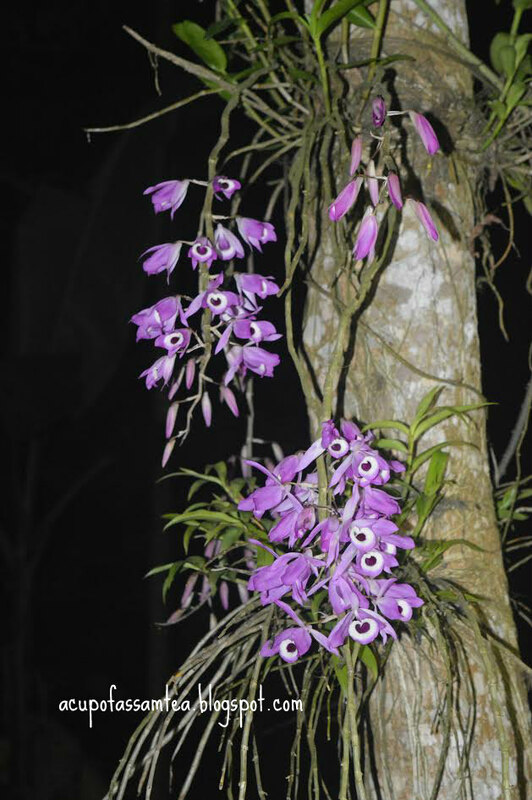 Yes, it is Bohag Bihu time, spring seasons of the Assam's most vibrant and whimsical festival. Bihu is the biggest and most favorite festival of Assam. Another name of Bohag Bihu is Rongali Bihu, Rongali means color, the color of food, culture, tradition, and love and assamese hospitality. I feel nostalgic; the nostalgy transports me directly to Assam, probably 20 years back Assam, where I spent my childhood and adulthood during the early 80s to early 2000. A few days before Bihu our whole neighborhood became fragranced whether it's Tilor ladu(Sesame balls) or Pitha(Rice cake). New leaves grow on the tree, Kapau Phool(Foxtail orchid) and Bhatau Phool bloom, Rose Chesnut blooms, and early rain makes it even fresh and fragrance. I would have been waiting on the same night for Bihu special magazine which is loaded with my favorite writers writing my Deuta (Dad) brought on the way back home from his work. Crisp paper of the magazines also smells like Bihu fresh and pristine. Our home would have been filled with guest my aunts, cousins. Our home itself is transformed into its own festivity, charming chit-chat, felicitous food, gleeful laughter and what not. Yup, those were the days feels still yesterday. Those days my mom would have been busy entertaining guest, cleaning and setting all Assamese Kanh kahi-bati (bell metal utensils) along with preparing food. My Dad would have been shopping for everybody buying new clothes including our domestic help Hiramni's family. It is a tradition of Bihu to buy new clothes. I recall a day before Bihu, my mom and my younger aunt, before she got married, busy making Bihu snacks pitha, laru(a sweet ball consisting of coconut, sugar or sesame and jaggery). 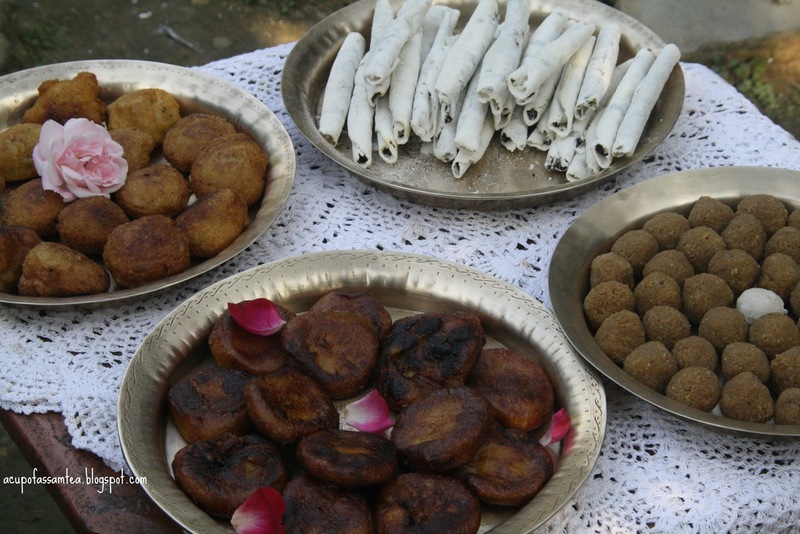 As a child, I and my brother used to take a sneak peak of the Bihu snacks. Our house is filled with those aromas and at the same time in a distance, you hear dhol beats and fragrance of blooming flowers. Our heart and mind were filled with the fragrance of Bihu memories, as I look back after 20 years. My mom and Aunt used to make a lot of snacks. Koka used to make sure that nobody return from our home without having snacks and a cup of tea. A tradition that Koka made, my mom is still continuing that tea tradition. Husori groups (Group of people performing Bihu dance) come to visit you for performing dance and music. Sometimes expectedly and sometimes unexpectedly. You have to be well prepared. Our front yard is filled with Bihu song and dance. As they say dhool beats brought thunderstorm. 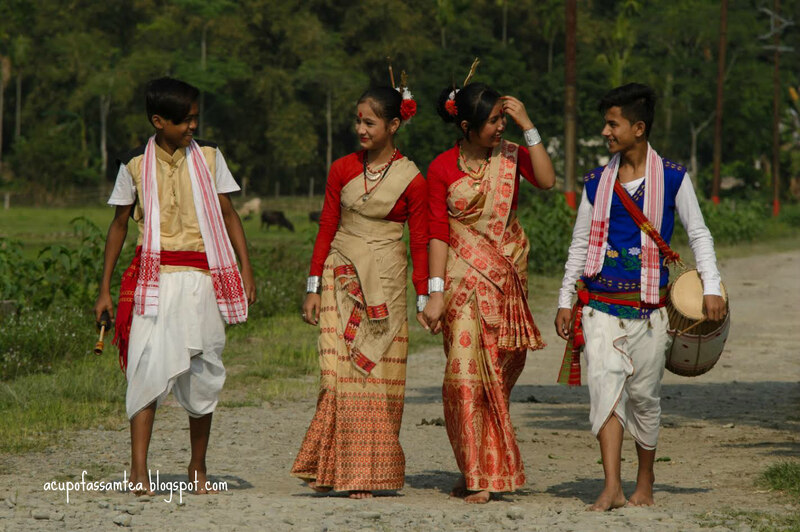 Buffalo horn trumpet(Pepa) is played and crisp sound of Nasonis (female Bihu dancers) dressed in assamese golden thread muga silk along with their graceful moves. 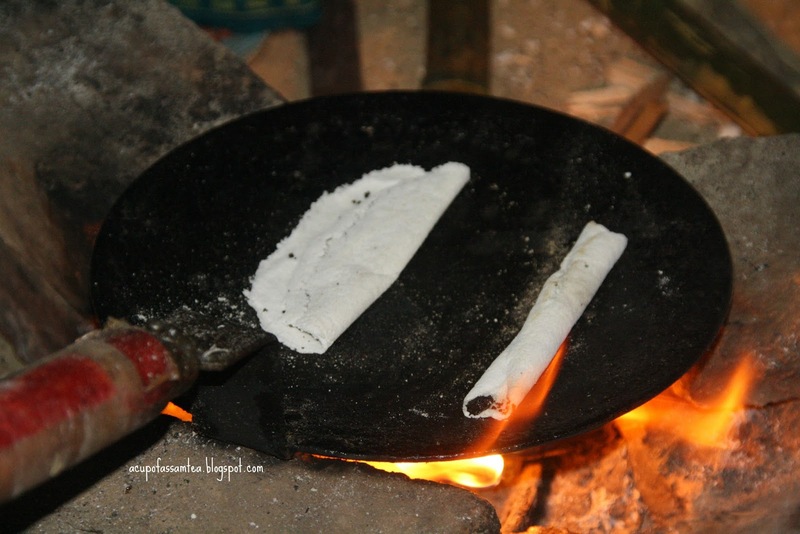 I still remember how we all used to sit and enjoy hot pitha from the tawa (Pan) with steaming hot tea for adults and milk for kids. Crispy, crunchy tilpitha(A rice creps with melting jaggery and roasted sesame inside) the taste that is only found at home and Nowhere in the world. Taste that I recall brought me home, brought back the beautiful phase of my childhood. After two-three weeks of Bihu when dhol beats fade, you can hear a flute in the distance. Even as a child, I could tell flute had so much pain. Someone is pouring his heart out. But as a teenager or adult, I understood that it was the translation of some heartbreaker's melancholy, who did not get his love in Bihu. Bihu morning after taking bath with turmeric and ground green gram, as an assamese belief that if you bathe with these, you will have no skin issues for the whole year, we used take blessings for our grandpa. A year back, before his death, while taking blessings from Koka(grandpa), his eyes were moist. The next Bihu was without Koka. After my Koka passed away we missed taking blessings from him. And it was a tradition to visit his cemetery with my aunts and take blessing from him in our minds, and Bihu color did not seem as vibrant as it used to be. Now after moving to the USA, we used to visit Bihu celebration either in Boston or New Jersey. It was always great fun wearing Assamese mekhela chadar and enjoying Assamese food and cultural programs. 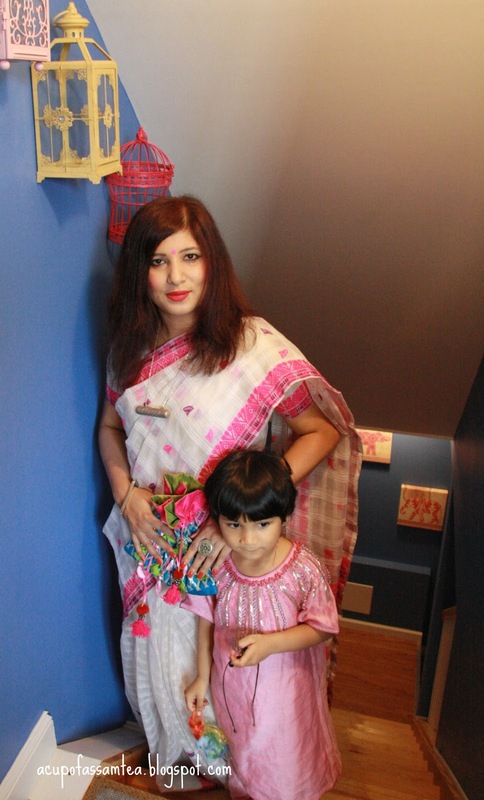 After having two kids, we hardly drive and go to Bihu to New Jersey and Boston. We now have a few more Assamese families in Connecticut, and we have nice get together with friends. Even though we celebrate Bihu here, but Bihu of Assam is still smitten with the memory of my Koka, my childhood friends, my brother, my mom's all homemade sweets and snacks and the whole vibes of Bihu. Today morning while dropping my daughter at school, she showed me, ma look spring is coming and our gladiolus is blooming. I felt great. I will make some pitha for my family perhaps not as good as my mom or Aunt, but something that I will offer to my children on this Bihu. Thank you so much. Happy Bihu to you guys as well ! So nice to read about other cultures. Happy Bihu! I have never tried, looks very much like the Brazilian tapioca, but will definitely love to try it! Nice post with beautiful photos of dishes and festivals during bihu. Thanks for sharing. Thank you so much Ana ! I love reading about other cultures, I would love to experience this is real life for myself. Happy Bihu to you! Sure please. Always welcome to Assam, India.Thank you so much Ania! Oh wow, I didn't even know about this festival. I am sure you are super excited about all the festivities. I have never heard of Til Pitha before too. I bet it's amazing. I am glad. Thank you so much. Please do explore Assamese cuisine, I am sure you will like it a lot as you guys always emphasize on healthy cooking. It is one of the most healthiest cuisine in India. awesome to know of such existence, would not have not if i didnt read through here, such vibrant customs out there.Happy celerations to you. I am glad. Thank you so much! Assam is one of my favorite trips I've ever made. But unfortunately I've not attended famous bihu. May be next time. Also you look great and the Til Pitha sounds tasty. Sure Please do visit Assam during Bihu. Thank you so much! India has some of the most colorful festivals in the world, with such delicious food. No wonder you miss your home during this times. I am sure your pitha would be very good and your daughter will love it. How true Joanna. Thank you so much! You and your daughter looks so lovely with your dress. Great reading about other country's cultures. Thank you for sharing. Happy bihu. I have heard about Bihu but not in depth. Your post has enriched my knowledge on this Assamese festival. 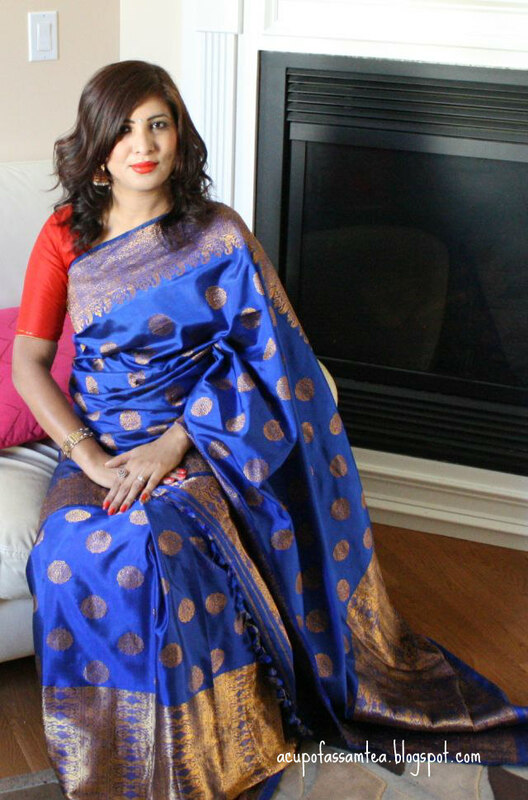 Loved your blue saree. I am glad Yukti. Thank you so much . That's called makhela chadar(Assamese style saree). I am not sure Is it any special to serve food in bell metal dishes?. I like the traditional food and cloth. Well done. That's an Assamese tradition Vijay. Thank you ! Happy Bihu to you. This is the first time I've heard of that celebration and it's great to read about it. Hope you had a lovely celebration. I would love to witness a celebration of your unique culture. I love learning about different people around the world. The food is unique and prepared with love so it must be really good! Nice article, I am so proud of being a son of Assam. Since they can get products in mass for less. Emily Blunt Anti Aging Products They offer it at the greater part the first cost.